Those new to the church — of every age and every stage of life — will find a caring group of inquiring Christians and a variety of programs that fit the needs of individuals and families. The pastor, staff and congregation of FPC are warm and welcoming to those new to the church, whether you are visiting or attending a class here. We want you to feel welcomed and at home, and we will do our best to help you find your place in the church. Our Sunday morning begins with Sunday School classes for all ages at 9-9:45 a.m., followed by informal coffee and conversation around the kitchen. Worship in the sanctuary begins at 10:15 a.m.
You’ll find everything from suits and ties to blue jeans on a Sunday morning. More important than what you wear to church, we want you to be comfortable here. Dress would probably be described as “casual,” much like many work places today. So don’t let what you wear keep you from coming to worship God with us. When you arrive, you will receive a bulletin that outlines the service. The first half of the service includes announcements, greeting and welcoming followed by prayer, singing, call to worship (focusing on the congregation and on what we have come to do), a prayer of confession and the assurance of pardon (God’s love and grace to us). The second half includes the scripture readings (both the Old and New Testaments), a sermon, prayers of the people, the Lord’s prayer (we say debts and debtors), affirmation of faith, offering, and charge and benediction. Musical instrumentation is traditional church worship music (piano and organ) with occasional handbells, guitar and other musical talents of the church membership who play for special music and offertories. Both traditional hymns and more recent Christian songs are sung. We love children here at FPC and welcome you to keep them with you during the service. However, for your convenience, a nursery for infants through toddlers is available. Your child will receive lots of loving attention from the volunteers in the nursery each week. For your older children, a specially-designed Children’s Bulletin and crayons are available from the ushers as you enter worship. No. You will not be asked to stand or to introduce yourself. We have greeters and ushers who greet each person as they enter, and they will answer any questions you may have. You are invited to fill out a card that is located in each pew rack with any information you would like to share with us and drop it in the offering plate. 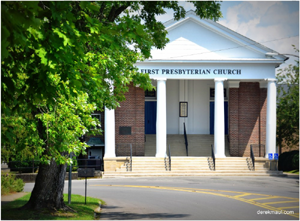 What Kind of ‘Presbyterian’ Are You? 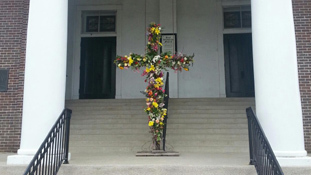 First Presbyterian Church of Fayetteville is a member congregation of the Presbyterian Church (U.S.A.). Currently the largest Presbyterian denomination, the Presbyterian Church (U.S.A.), which has its national offices in Louisville, Ky. , was formed in 1983 as a result of reunion between the Presbyterian Church in the U.S. (PCUS), the so-called “southern branch,” and the United Presbyterian Church in the U.S.A. (UPCUSA), the so-called “northern branch.” This reunion has been a bright spot of reconciliation and unity in the history of American Presbyterianism. To learn more about the PC(USA), visit www.pcusa.org and look around! We would love to hear from you and answer any questions you might have about our church, either before your visit or afterwards. To send an email, please use our contact form.